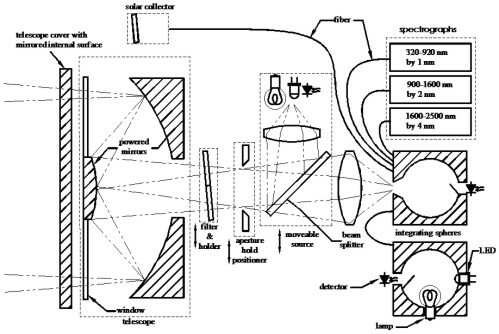 Design of the lunar irradiance instrument is based on commercially available spectrographs. These spectrographs can be stable and sub-components are readily available to make a custom instrument. To account for their non-uniform response and the non-uniformity of the lunar image, the spectrographs are illuminated by an integrating sphere at the focus of a conventional on-axis, 25-cm diameter telescope. Below is a simplified optical schematic showing one possible configuration. Optical schematic of the lunar spectro-radiometer. Moonlight is collected with a 25-cm (10 inch) diameter, Ritchey-Chrétien f/4 telescope. The moonlight passes through one of the positions of a filter wheel before being focused to form an image at the plane of an aperture wheel. Following the aperture wheel is a lens that re-images at f/1.5 onto the entrance aperture of an integrating sphere. To minimize sensitivity of the response to small pointing errors when collecting the entire lunar disk, the lunar image under fills the aperture. Diffused light from the sphere provides uniform illumination of three fiber bundles, each of which is connected to a spectrograph covering a different spectral range. Some of the filters will measure linear polarization. Other filters along with reference sources and detectors will measure changes in the spectrograph wavelength scale and changes in optical through-put at various stages. A similar simpler instrument that observes stars is to provide atmospheric corrections. In this instrument starlight is directly coupled into the spectrographs. Both instruments together are compact enough to fit on a single mount and to fly on a high-altitude balloon. Finally, there is a provision to measure the solar irradiance that will allow LUSI to provide the lunar reflectance as a secondary data product. A small diameter, non-imaging solar collector will fiber-couple sunlight into the integrating sphere. Stability of the collector throughput will be monitored using a small, detector-stabilized LED external source. Calibration of the instrument will be performed at the facility for Spectral Irradiance and Radiance responsivity Calibrations with Uniform Sources (SIRCUS) at NIST. This detector-based facility has its fundamental radiometric scale is set by an absolute cryogenic radiometer, the Primary Optical Watt Radiometer (POWR), whose power responsivity is known and ultimately tied to electrical standards. Calibrated detectors and precision apertures set the irradiance scale. However, a stable and relatively uniform source is needed to transfer this scale to the lunar instruments. To simulate the Moon, a collimator coupled with a laser-fed integrating sphere source will be used to provide a large diameter beam that diverges by the angular extent of the Moon. At the focus of the collimator the integrating sphere exit port will be fitted with apertures of various shapes and orientations to test sensitivity of the instruments to different lunar phases. A similarly positioned linear polarizer will allow testing of sensitivity to polarization. The source feeding the sphere will be either one of several existing lasers at SIRCUS that provide continuous wavelength coverage from 210 nm to 2500 nm or a monochromator fed by a supercontinuum source. The best uncertainties associated with transferring the irradiance and radiance scales to a radiometer are expected to be 0.1 % (k=1) or better from 350 nm to 2500 nm. However, the overall measurement uncertainty when deducing the lunar irradiance will depend on additional factors, including the stability of the lunar instrument, expected to be at the 0.1 % level, and the uncertainty in deducing the transmittance of the atmosphere, which will vary strongly with wavelength, estimated to be approximately 0.5 % through visible atmospheric window bands and less through the longer wavelength window bands. Knowledge of the atmospheric transmittance is expected to limit the overall uncertainty to approximately 0.5 %.